The ‘Speaker Spotlight’ continues, bringing an insight into the fantastic arena talk programme and some fascinating facts about the speakers behind them. Pat works with two heritage organisations – Free UK Genealogy which is a charity taking a lead on open genealogy resources, and the other is Heritage People – a social enterprise bringing together organisations needing heritage professionals and heritage professionals wanting to volunteer/freelance without self-employment, with a particular focus on integrated heritage management and work in the UK Overseas Territories. A tour of new features and plans for FreeBMD, FreeCEN and FreeREG, and news of what is happening behind the scenes at Free UK Genealogy and in the wide world of Open Genealogy. Listening to my mother and grandmother talk about family and trying to work out in what way ‘Granny Austin’, ‘Auntie Win’ and many others were related to me. It is my ambition to visit every British Overseas Territory – I’ve already visited Tristan da Cunha, the remotest inhabited island in the world, where everyone’s genealogy is known, back to the time they arrived on Tristan! 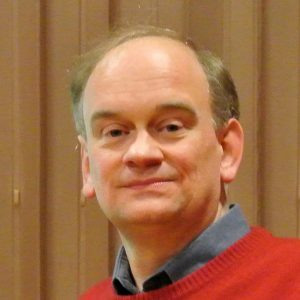 Mike Sharpe is a professional genealogist, writer and lecturer specialising in the local and family history of Birmingham and the wider West Midlands. He runs Writing the Past (www.writingthepast.co.uk), a family history research and writing service. I’m West Midlands based and THE Genealogy Show is on my doorstep, which is great. I have a 20 minute drive to the show and get to sleep in my own bed! There’s always something new in the family history world and events such as this are a great opportunity for networking and keeping up with what’s going on. I’m particularly looking forward to hearing about advances in DNA genealogy, which is changing so quickly. My grandmother was the sort of person who kept in touch with everyone. I would sit at her kitchen table and listen to her discussing family tales with her brother, my great-uncle, and try to make out who everyone was. One day my great-uncle sketched a family tree for me on a piece of parcel paper, which I still have. From that day, I was hooked! My website is at www.writingthepast.co.uk and I’m on Twitter at @WTPgenealogy. It’s not a fun fact, but we should all recognise that we have a story to tell. It’s really important to write down our family histories and our life stories to share with others. By taxi. Driving in -Birmingham frightens me!I I’m a Northumbrian/Durhamite , but living down south (Solihull) for last 4 years. I will be at the show however. There is always something new to learn. Fun Fact. My ancestors told fibs! Even information in our Bible is incorrect. My interest began when I inherited my paternal Family Bible. And stories my maternal grandfather told me. Research began in 1978 -qualified and became adult tutor for many years. Self employed working for many North Easteners living abroad. Made many friends. Lovely `hobby`-obsession?